Working predominantly in porcelain, assorted found objects, silicone, timber and concrete, my art practice revolves around creating interesting forms that can be felt and understood visually. Certain forms have come to hold specific inherent connotations and functionalities whether factory or cottage made. The territory of invention that interests me is in recognizing the meanings and functions which certain forms inherently hold and replacing and/or supplanting them with a new role. Moulded and slip-cast porcelain objects serve much in the same way as a photograph; they are like a memory and prove the existence of the original while taking on a life of their own that raises the issue of authenticity. By the physical manipulation of cast vernacular objects through subtraction and addition, secondary cultural associations arise to dramatize and enliven the mundane. 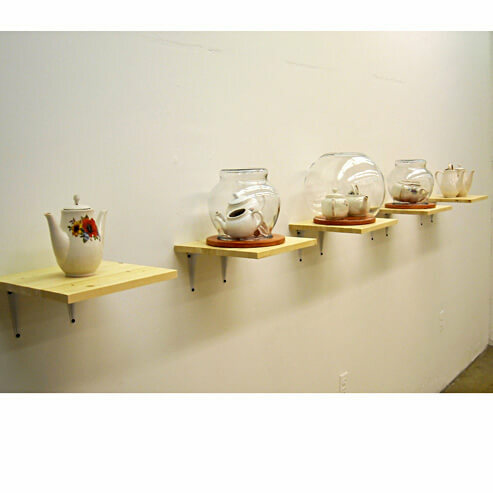 I seek to engage viewers with my work by drawing on objects that can relate to some aspect of our daily lives. In this way, one can relate themselves to the work, and even the form of the work to their own body.